Pinterest continued being a big traffic driver for me. In fact, it drove about 45% of my traffic this month. I think is mostly due to my exceeding my 500 BoardBooster pins about two weeks. Last month I didn't quite make it to 500 pins so to make sure I reached 500 pins in August I increased the number of pins scheduled to each board. I apparently didn't add correctly because I ended up overshooting my goal of 500 pins by about 250. To avoid running out of pins with two weeks left in the month I upgraded my subscription from 500 pins to 1,000. This cost me an extra $1.85 and I didn't lose any momentum. So it was worth it. With this surge in pins, you would think that I would have met my goal of 1,000 followers. Towards the end of the month, I slacked off on sourcing pins for all of my boards and ended up pinning less for a few days. Part of the reason I didn't hit my social media goals is that I didn't post enough on them. And I didn't post enough because I didn't stick to pre-scheduling my posts. I try to pre-schedule the majority of my social media posts because it allows me to be active throughout the day without having to be on social media all day. I did do a decent job with Instagram and Facebook in the beginning of the month which is evident in having a decent amount of traffic come from Facebook and Instagram. 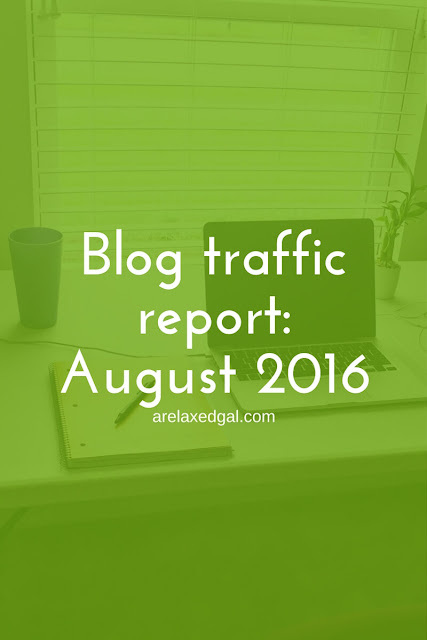 I probably would have had more traffic from both if I hadn't slacked off during the second half of the month. The opposite was true for Twitter. I slacked off at the beginning of the month and picked up during the second half. Pinterest was the only social account where I was consistent with pre-scheduling. While I didn't hit my goals this month I did see some decent growth across my social accounts. Some of this can be attributed to me promoting my social accounts. I promoted my Facebook Page multiple ways in a P.S. in my blog posts, in tweets and on Instagram which helped me reach a net of 47 followers. This surpassed my August goal. I also promoted my Pinterest profile in some of my tweets. Grow my pageviews to 6,000. I didn't reach my goal in August of 5,500 pageviews, but I came close. If I had promoted more I may have reached my goal. To make it to 6,000 pageviews I'll be doing constant promotion in some Facebook groups and my social accounts. Grow my Pinterest followers to 1,100. BoardBooster will help me achieve this, but I'll need to work hard on making sure I've sourced enough pins for each board to make it through the month. Post on Facebook 1-2 times a day. I'll be leveraging Hootsuite to help me post on my Facebook page. My goal is to have at least one post be content from my blog. Post every day on Twitter. I'll continue using Hootsuite to pre-schedule my tweets and have been able to tweet a lot during the first few days of September. Post on Instagram at least once a day. So far I've been doing this the last couple of days.